The different types of coffee drinks may seem confusing at first. However, instead of ordering the same drink every time you visit a coffee shop, you should try to find out more about some alternatives so that you can widen your experience. 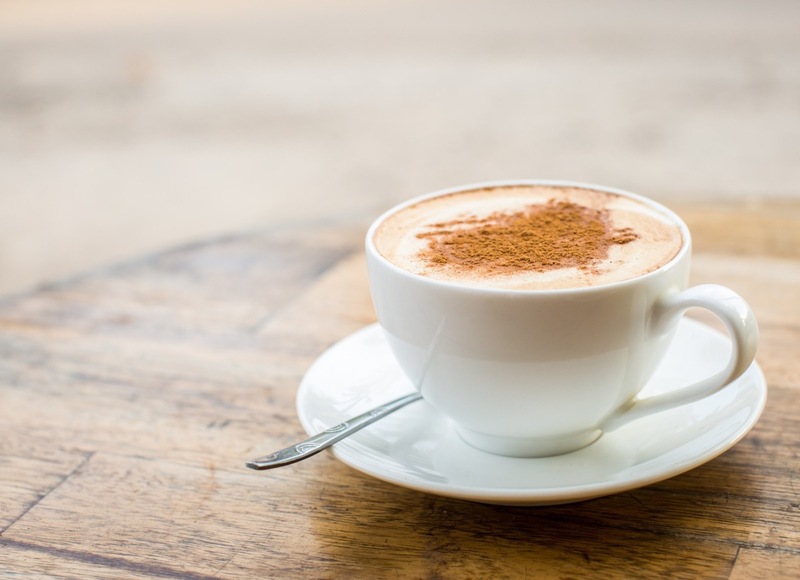 This article will help you understand the differences between two popular coffee drinks, latte vs mocha. – How each of the two coffee drinks generally tastes. A coffee drink that is made from mixing espresso with steamed milk is called “latte”. This English word is actually a short for the original Italian name, “Caffe Latte”, which basically means “milk coffee”. Sometimes, it is also called caffelatte or caffellate. Latte is all about having smooth and silky microfoam – but note that the microfoam is different from the thick and airy foam in cappuccino (see our previous post about Starbucks Cappuccino vs Latte). Latte has a distinct look and mouthfeel due to the texture of the microfoam. Meanwhile, the color is usually brown or light brown. The color becomes so because the espresso is mixed completely with the milk. Latte originated in the same place as espresso, which is Italy. 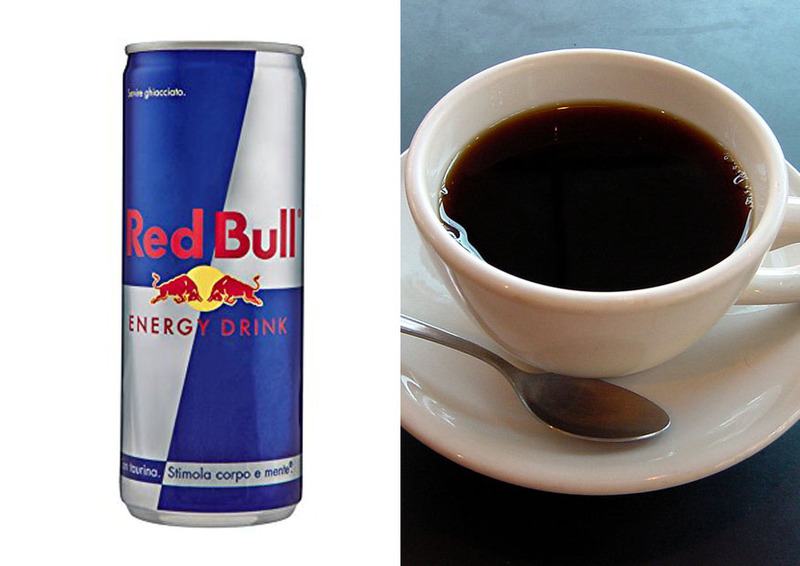 It has become a very popular drink, especially for breakfast time. The French cafe au lait and the Spanish cafe con leche are similar drinks. Meanwhile, in the United States, latte began to gain popularity around the mid-1900s. Latte is very popular because the coffee flavor is very diluted by the milk, making it suitable for many people. Also, it can be tweaked by adding various flavorings or toppings. In the modern world, latte drinks in coffee shops are popularly served with latte arts. A drawing is made on the top of the foam by pouring and swirling the milk carefully. Other ingredients such as cocoa powder or chocolate syrup are sometimes used for latte arts as well. However, the latte art is more of an optional feature, and you may even order a cup of latte without the foam if you prefer. As long as the coffee drink is made from double shots of espresso and 6 – 8 oz steamed milk, it can be rightfully called latte. A standard serving of latte is usually prepared in a 240 ml (8 fl oz) cup, as noted by this Wikipedia article. First of all, you need to prepare some espresso. You may use one shot or two shots of espresso, depending on your preference. A shot of espresso is about one fluid ounce. Pour the espresso into the cup. Next, you need 5 – 6 fl oz of steamed milk. Actually, you may use any kind of milk, including 2% milk, whole milk, nonfat milk, almond milk, and soy milk. However, 2% milk is usually preferred because it can give a good balance of flavor and texture. Steam the milk, and then pour them into the cup. Note that latte is not a layered drink. The espresso and the steamed milk should be mixed into one. This is usually already achieved when you pour the milk into the cup, but you may stir the content a little more. Finally, you can top the cup with a thin layer of milk foam. The thickness of this layer should not be more than 1 cm. Latte has a very distinctive flavor. It has a coffee flavor that has been greatly toned down by the milk. As the effect, you won’t find any extreme bitterness or acidity. The coffee flavor is mild and smooth. There is also some sweetness from the milk. The texture is smooth and silky. Such texture is created by the microfoam from the milk. However, latte is not as thick or velvety as cappuccino. Note that the original latte is not sweetened. You don’t really have to add sugar into the drink. However, in the United States, latte drinks are often sweetened with 3% or more sugar. If you need to limit your sugar intake, you should ask your latte to be unsweetened when ordering from a coffee shop. 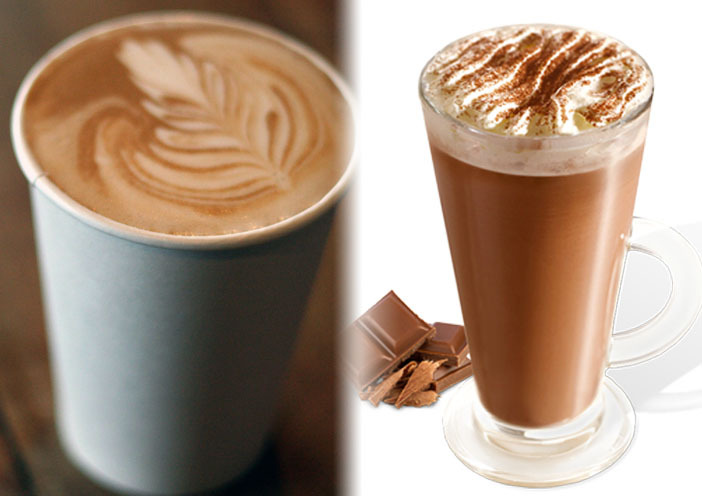 Mocha is also called “Caffe Mocha” and “Mocaccino”. It is the chocolate lover’s delight! It is basically a variant of latte, as it is made by combining espresso with milk and chocolate. Also, it has a similar espresso-to-milk ratio as latte. However, the biggest distinction of latte vs mocha is the addition of white, dark, or milk chocolate into the coffee drink. There is no specific requirement for the chocolate. You may use any kind of chocolate in any form. The amount also depends on your taste. 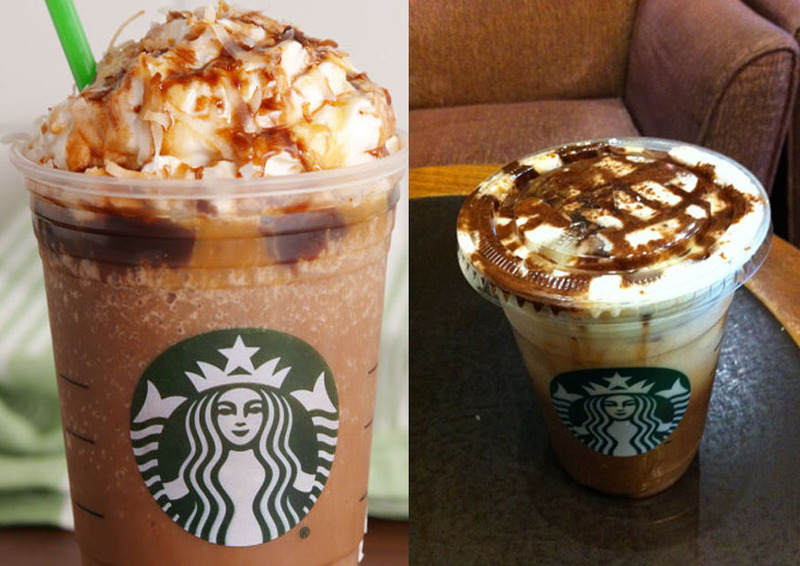 Some coffee shops make their own chocolate recipes for their mocha drinks, while others simply use chocolate syrup or broken-down chocolate chunks. The topping is also flexible. Some mocha drinks are served with foam and may come with latte arts as well. However, whipped cream is more commonly used, along with some dusting of cinnamon or cocoa powder. Some people even add marshmallow pieces to the top of their mocha, which is a reminiscent of hot chocolate. As mentioned above, mocha can be made by first making a cup of latte and then followed by adding some chocolate. However, you may need to reduce the amount of milk in order to accommodate the chocolate. For example, you can use two shots of espresso and just 2 – 4 fl oz of steamed milk, and then you can add about 2 fl oz of hot chocolate. For the top layer, you may use a thin layer of milk foam. Alternatively, you can use some whipped cream. You can further add some toppings such as cocoa powder or cinnamon powder. Some people also add chocolate syrup and marshmallow pieces to the top. Of course, chocolate and coffee have been used together for centuries not only for drinks, but also cakes and confections. It is easy to see why. Each substance tends to enhance the flavor of the other quite well, and the chocolate may introduce some more sweetness or a unique bitterness depending on the type of chocolate that you use. The texture of mocha is usually a little bit thicker than latte. This is because of the added chocolate. The topping may also make it even thicker. 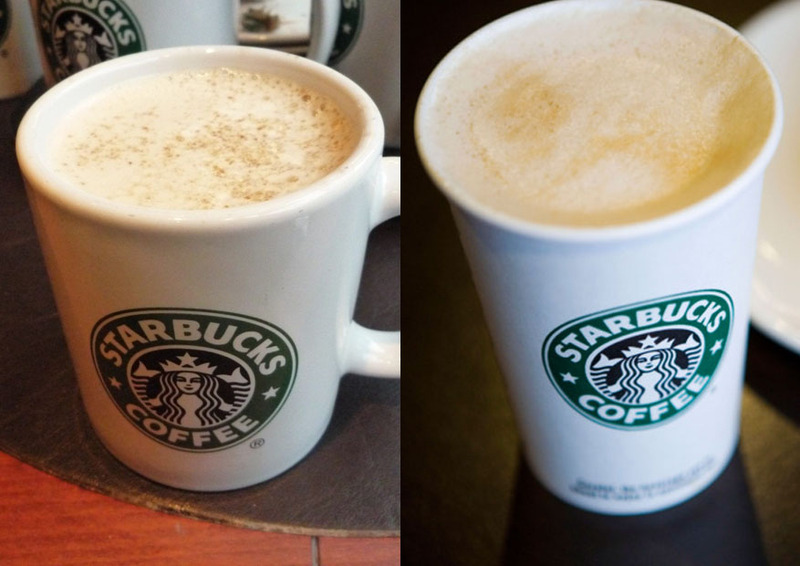 Latte vs mocha are two different drinks made from espresso and steamed milk. However, latte only consists of the two, and may have a thin layer of milk foam on the top. Latte has a smooth and mild coffee flavor. 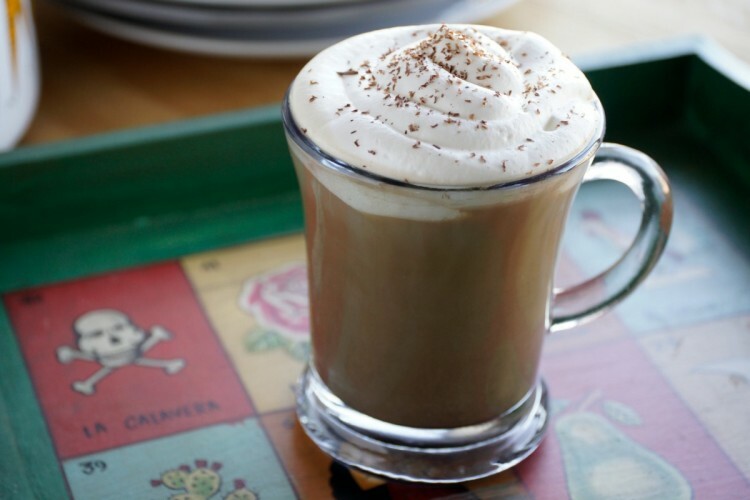 On the other hand, mocha is characterized by the addition of chocolate into the drink. Mocha has coffee flavor that mixes with chocolate. The texture is usually a little thicker.